basketball court in February to Juni Primary School. values awareness, using basketball as the medium. included basketball drills, techniques, life skills training and Olympic values education. the Juni Primary School basketball court. future leaders of PNG,” Martin added. 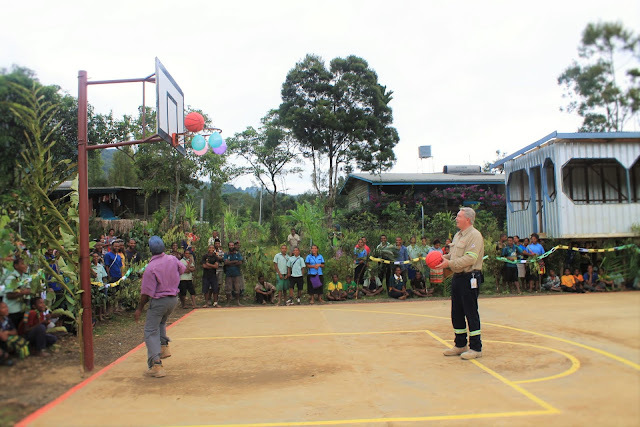 improvements ExxonMobil PNG has made to their basketball court. excited and cannot wait to use the basketball court,” said Kaiabe. Photo caption: ExxonMobil PNG’s Hides Gas Conditioning Plant Superintendent Ken Rhyason and Head Teacher for Juni Primary School Shelly Kaiabe trying out the basketball court at Juni Primary School.